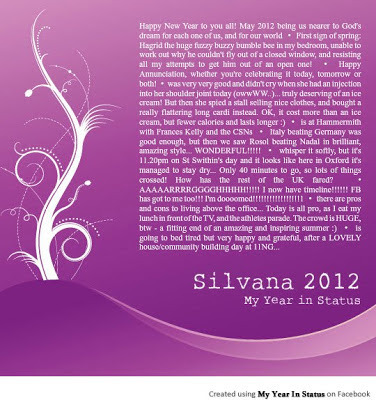 Thanks to my friend Cloister I came across a Facebook app which creates a collage from the past year's status updates. So I created two - the first one sticking with FB's randomly selected updates, the second with more input from me. In these collages are home-brewing, a summer of glorious sport and a frozen shoulder... rain, snow, even the odd bit of sunshine... a workshop with the CSNs, the end of the Mayan calendar and various snapshots of life as an RSCJ, in Oxford and here at our house in Norham Gardens. Of course, what have been left out are the status updates where I have posted links, especially ones to this blog. 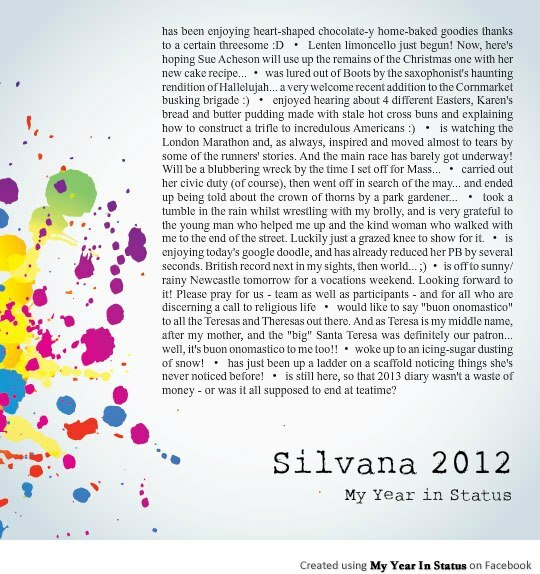 Some of those status updates are picked up in my blog: the Cornmarket Hallelujah, the Olympics, food, feasts, sunshine and rain - they're all in here! In addition, it has been a year of reading Paul's epistles each month and becoming increasingly enthralled with this whole writing/blogging thing. I'm leaving Paul for now, but hope my delight in writing continues and develops in 2013.